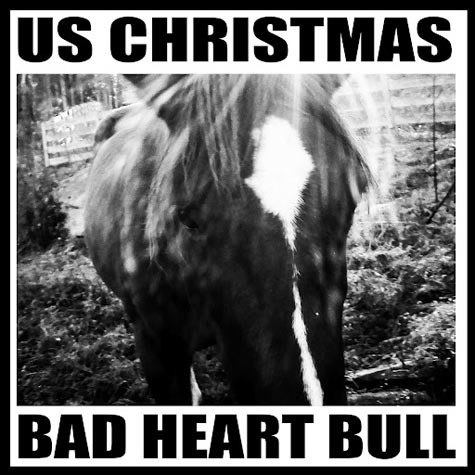 U.S. Christmas' (USX) first album, Bad Heart Bull, is being reissued on vinyl by Play The Assassin at a very limited quantity of 250 with proceeds going to the National Breast Cancer Foundation and the Oglala Sioux Tribe/Pine Ridge Reservation. Collectors will appreciate that the vinyl itself will be available in three different variations, which are detailed below. All info has been lovingly provided by the good people at Earsplit PR. The band's 2011 single-song release, The Valley Path, was reviewed at Stereokiller. New Jersey-based indie imprint Play The Assassin will issue Bad Heart Bull, the debut release from Appalachian doom folksters, U.S. CHRISTMAS on May 8, 2012. Originally self-released by the band on CDR in 2004, the vinyl will be limited to 250 copies and issued in three different configurations -- ultra clear with black splatter; bone white with blue swirl, and swamp green with yellow haze. Vinyl/T-shirt bundles and autographed test pressings are available with all proceeds being split between the National Breast Cancer Foundation and the Oglala Sioux Tribe/Pine Ridge Reservation. Bad Heart Bull is a 43-minute slab of mutant doom blues; think Neil Young without the “Heart Of Gold.” “I used a lot of different electric guitars and amps –- a little Fender Vibro Champ for some of the leads on ‘Black Snake’ and an Orange full-stack for the wall of distortion, but the foundation of Bad Heart Bull was Les Paul Customs and Marshall Mosfet stacks,” says Hall. Pre-order Bad Heart Bull now at THIS LOCATION. Now dubbed USX, U.S. CHRISTMAS is an apocalyptic space-rock/doom ensemble originating from the Appalachian Mountains of North Carolina. Led by guitarist/vocalist Nate Hall, the band, now featuring BJ Graves (drummer), Justin Whitlow (percussion, sounds), Josh Holt (bass, drones), and Meghan Mulhearn (violin) -- have entered their second decade of blurring the boundaries of crushing rock and acoustic dark blues. The band’s eclectic musical influences range from modern metal and doom to guitar slingers and classic artists including Neil Young & Crazy Horse, Hawkwind, Caustic Resin, and Neurosis. While the music of U.S. CHRISTMAS has never been described as being jammy or amorphous, the band’s brand of dirty, loose psychedelic rock originates from members bringing their individually-created musical parts into a room together and letting their collective synergy form a singular groove. One would think the spaciness of the music would bring lyrical themes dealing with outer-space, yet their lyrical content actually focuses more towards that of nature, earth, and terrestrial human history. After a pair of self released CDRs (Bad Heart Bull and Prayer Meeting), U.S. CHRISTMAS released their third album, Salt The Wound, via Russia’s RAIG Imprint, and then signed with the United States-based, Neurot Recordings (home of Neurosis, Shrinebuilder, Across Tundras, etc.) to release three studio offerings: Eat The Low Dogs, Run Thick In The Night and The Valley Path. Hall will be issuing his debut solo album, A Great River, via Neurot next month.